If early returns hold up and the March 14 coalition emerges victorious in Lebanese parliamentary elections, sending a resounding defeat to Iran’s proxy, Hezbollah, then one of the most important “unsung heroes” in the vote will have been… Vice President Joe Biden. Biden’s Lebanon foray is a salutary reminder for the Obama administration in its overall engagement with the Middle East. Elsewhere in the region, the administration seems to be directing a policy devoid of sticks (except toward Israel’s settlement policy, which is another story altogether). The President’s Cairo address to the world’s Muslims, for example, included not a single hint of “negative incentive”; while he eloquently made the case for religious freedom, democracy, women’s rights, and peaceful nuclear energy, there were no suggestions of negative repercussions for any country that rejects the President’s entreaties. After the polite applause is forgotten, the result is likely to be indifference on the part of most Arab and Muslim leaders (except, again, on settlement policy). In Lebanon, Biden’s timely reminder to locals of what they might lose by cutting deals with radicals and extremists suggests that Chicago politics is alive and well in the Middle East. The Chicagoan in the White House should pay attention. Comments are limited to MESH members and invitees. I have nothing but respect for my old boss Rob Satloff (who has forgotten more about the politics of the Middle East than I will ever learn), but there is simply no evidence to suggest the visit of Vice President Biden had a significant effect on the Lebanese elections. From Washington, of course, it is often tempting to think that what U.S. policy-makers say and do has a decisive effect on events on the ground. But early indicators suggest that it was words and deeds of those in Lebanon that tilted the election in favor of the March 14th coalition. Specifically, the events of May 2008, the poorly chosen words of Hasan Nasrallah in the run-up to the election, the timely intervention of the Maronite patriarch, and high voter turn-out were among the factors which most influenced this election. Of those four, the events of May 2008—when Hezbollah and its allies took over the streets of Beirut by force—had perhaps the most significant impact on the Christian electorate and probably sealed the election for March 14th in Achrafieh (Beirut 1). The fact that Hasan Nasrallah called the events of May 2008 a “glorious day” a few weeks back is another example of how badly Hezbollah has misjudged the political mood of Lebanon’s Christians and the impact of May 2008. In the end, I understand that taking a hard public stance against Islamists is a policy Rob would very much like to see this administration pursue throughout the region. But let’s not get carried away here. A multiplicity of factors help explain what happened yesterday in Lebanon, and few analysts—even those of us who happen to be fans of the current administration—believe the Vice President’s visit was important in comparison to, say, voter turn-out in Zahle or the effects of the Hezbollah-provoked fighting in 2006 and 2008 on the Lebanese economy. Let us not allow, in other words, our policy preferences to cloud our analysis. Andrew Exum is a member of MESH. I also have to disagree with Rob Satloff here—I don’t think the Biden visit had any significant impact at all. I was in Beirut when he passed through, and there was certainly no feeling among the March 14 supporters whom I spoke with that the whirlwind visit had given them any additional momentum. March 8 analysts, on the other hand, seemed quite convinced that—as yet more evidence of U.S. “interference”—it would play to their advantage. The diplomatic community seemed largely confused as to why he had come for such a short period of time, while Beirut taxi drivers were unanimously annoyed at the traffic snarls that high-level visits inevitably generate. 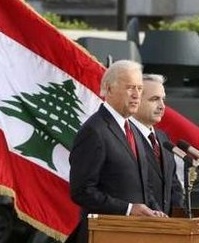 Lebanese voters certainly didn’t need Biden to remind them of the possible costs of a M8 win on relations with the United States, nor did he say anything new or surprising in this regard. Even more important, it might be argued, was the (potentially much greater) loss of Gulf assistance, investment, and tourism. To the critical factors that Andrew Exum has identified, one could also mention Michel Aoun’s ill-timed tripped to Syria, and some fairly effective scare tactics/negative campaign ads by the M14 parties. Rex Brynen is professor of political science at McGill University. Andrew Exum and Rex Bynen are right to emphasize the various internal mechanisms that compelled the Lebanese majority to vote for March 14. However, as Rob Satloff argues, the Biden visit did play a significant role. Due in part to the recent history of U.S.-Lebanon relations—from Eisenhower to the Marine Barracks bombing to Bush 41’s tacitly green-lighting Syrian hegemony in Lebanon—the Lebanese cannot help but read virtually every move in Washington in terms of how it will affect their status. Anxiety over the American level of support for pro-democracy figures in Lebanon reached its heights during the U.S. election campaign, when then-candidate Obama promised to re-engage Damascus. This, the Lebanese assumed, would come at their expense, and Syria would once again extend its control over their neighbor. What soothed March 14 was the composition and tactics of the team Obama sent to Damascus, which included one of the authors of the Syria Accountability Act, NSC staffer Dan Shapiro, and Acting Assistant Secretary Jeffery Feltman, the former U.S. ambassador to Beirut, who, before and after they went to Damascus, visited Beirut and consulted with March 14 figures. Feltman, one pro-democracy Lebanese official is supposed to have said, “is U.S. policy toward Syria and Lebanon.” While Feltman has rightly earned the admiration of March 14 politicians—he was apparently targeted in a car-bombing incident shortly before leaving his post as ambassador—that’s not precisely true. Feltman, as well as Shapiro, are perhaps best seen as the spearhead of a U.S. policy that supports the sovereignty and independence of the Lebanese state, a policy the Biden visit, like that of Secretary Clinton, served to reinforce. Now with the elections over, the real test for U.S. policy will come as the March 14 majority forms the cabinet. March 14’s Saad Hariri and Walid Jumblatt have rejected the Doha formula that gave Hezbollah and its allies a blocking veto, a prerogative that the Party of God won not through ballots but force of arms when it overran Beirut last May. If Hezbollah and Syria’s other allies in Lebanon are determined to resort to more violence to have their way, what is Washington prepared to do on behalf of Lebanese sovereignty and independence? Lee Smith is a visiting fellow at the Hudson Institute. I just returned last night from observing Sunday’s elections in Lebanon and have to say that from what I heard and experienced, Andrew Exum and Rob Satloff are both right. But Rob is more so—and not just because he’s my boss. Andrew argues Christian voters had no need for encouragement to vote for March 14, which is for the most part true. Hezbollah’s overreach during the dark days of May 2008 remains fresh not only in the minds of Lebanon’s Christian community but in the Sunni and Druze communities as well. Nasrallah’s pre-election speeches designed to rally his base did nothing to ease their concerns, and many on Aoun’s campaign team expressed frustration with their timing. However, had the United States not signaled strongly and often that the shape of the next government would impact its relationship with Lebanon, many fencesitters, concerned about where the wind was blowing, may have decided to sit on their hands or vote for Aoun. March 14’s campaign, predicated heavily on the twin threats of Iran and Syria to Lebanese democracy, may not have generated the credibility and momentum that it ultimately did. The Obama administration’s message to Lebanese voters, which was both nuanced and graduated, was useful in two critical ways. First, the words themselves reassured the Christian community and March 14 supporters more generally that the United States would not abandon them to rapacious Hezbollah demands or allow Syria to reassert itself in Lebanon . To that part of the Lebanese polity paranoid about America’s new realist leanings, especially toward Syria, these reaffirmations were a critical indication of U.S. seriousness. That the message was delivered in Beirut not by the U.S. ambassador to Lebanon but by our Secretary of State and Vice President made the message even more powerful, and emboldened March 14’s leadership. Second, the message made clear to Hezbollah’s leadership and to Aoun’s electorate that should they win and put together a government unacceptable to the United States, all of Lebanon would pay a price for their decision to do so. If only the Bush administration had done the same prior to the fateful 2006 elections in West Bank and Gaza. At that time, a number of us within the administration urged the administration to make clear to Palestinian voters that while they were free to vote for whomever they wanted, they should consider as they entered the ballot booth that the United States could not cooperate with a Hamas-led government, which would have unfortunate consequences for all Palestinians. The State Department successfully argued that such a statement, however artfully delivered, would be the kiss of death to Abu Mazen and Fatah. Instead we pitifully arranged numerous USAID-sponsored ribbon-cutting opportunities for the feckless Palestinian president, who skipped most of them. I argued then and now that it would have been better for the Palestinians to have full information to inform their electoral choice. Where the United States stood mattered in those elections, quite apart from our relationship with Fatah, and Palestinians should have had the benefit of knowing how their interests would be impacted by their choices. In the end, Fatah became a victim of protest votes cast for Hamas, and all Palestinians reaped the whirlwind when the latter won. Moreover, the United States, when it subsequently isolated the Hamas government, was saddled with the narrative that we support democracy but only when it serves our purpose. Had we been clearer up front, we may not have lost that public messaging battle, and Fatah may not have lost the election. The situation in Lebanon for March 14 just a month or so ago was not so dissimilar to Fatah’s. Corruption, government ineffectiveness, and division all weighed March 14 down, contributing to a malaise and an expectation that March 8 was going to win. Aoun’s principal rationalization for aligning himself with Hezbollah was that the Christian community could not count on the West, and that it needed a strong leader—him—to represent them amongst other strong sectarian leaders, i.e. Hariri and Nasrallah. The administration’s persistent messaging, including the President’s defense of the Maronite minority in his speech in Cairo, devastated this argument and contributed to the shift in momentum. Perhaps even Hezbollah felt it. Why, after all, did they so badly undercut Aoun just weeks out from the election? Perhaps they didn’t want to be blamed for the international isolation that they thought would ensue following their victory, especially as Hezbollah feels its weapons provide sufficient safeguards for its interests. In any case, the Obama administration deserves credit for setting the right tone and for making clear how the United States evaluated its interests in Lebanon. Not only was it the responsible thing to do but it is what Arabs most want to hear: honesty. As Rob correctly argues, the administration should do more of it. J. Scott Carpenter is a member of MESH.